Japanese mobile and console game publisher GungHo Online (TYO:3765) has announced its FY15 financials for the 12 months ending 31 December 2015. Sales were down 11% compared to 2014's record amount to $1.3 billion (¥1.5 trillion). Operating profit was down 23% year-on-year to $600 million (¥724 billion). 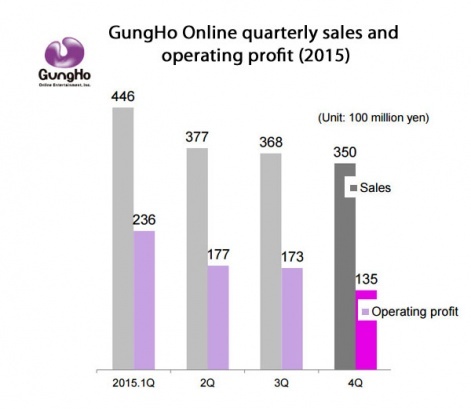 More worryingly for the company, and investors, all four quarters of 2015 saw GungHo's sales and operating profit decline. The company - which generates the majority of its revenues from Japan - noted that "domestic smartphone game market has moved out of the explosive growth phase" and is "moving into a saturation period due to the slowdown of such diffusion and an oversupply of games". Of course, the main driver of GungHo's financials remains Puzzle & Dragons, which generated 89% of sales in 2015. Despite competition from Mixi's Monster Strike and LINE: Disney Tsum Tsum, GungHo claims it remained the most popular mobile game in Japan during 2015. Its monthly active player numbers are in longterm decline, though; something GungHo hopes to address with Cooperative Play Dungeon Alpha, a separate co-op dungeon version of the game, which was released in October. In brighter news, Puzzle & Dragons experienced strong growth in North America during 2015, and the game will be officially released in China through Tencent in Q1 2016. Aside from Puzzle & Dragons, GungHo revealed that new game Summons Board had done 4 million downloads in Japan, and it has just been released in Taiwan, Hong Kong and Macao. RPG Divine Gate has done 5 million downloads in Japan. The company has also signed a strategic deal with Gameloft, which will see GungHo release Disney: Magic Kingdoms in China. In addition, it's planning to release a new mobile game in Spring, and survival action title Let It Die (from inhouse studio Grasshopper) for PlayStation 4. Do you think that it is a decline in the game itself or a decline in the market for puzzle-rpg games?